SEOUL -- Researchers unveiled South Korea's first smart robot prosthetic leg, which is lighter and make users feel more natural than foreign products. Once charged, the robot leg can be parked for up to four hours without replacing the battery. Using a dedicated smartphone app, the wearer can change the mode of operation. 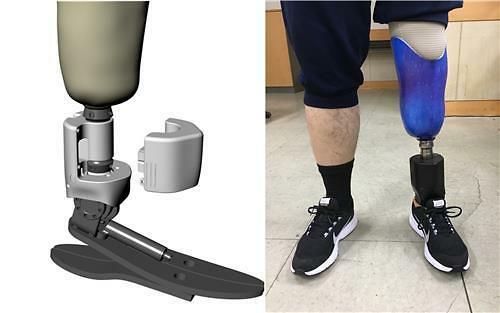 The Korea Institute of Machinery & Materials (KIMM) said in a statement Wednesday that the robot leg mimics human movements and reduces the pain and physical stress of wearers. A pair of springs was used together with a motor drive in the ankle to reduce weight and provide a natural kickback in the event of sudden stoppages. Compared to bulky and heavy foreign products, KIMM's robot leg is lighter and smaller, weighing about one kilogram (2.2 pounds). The robot leg's original fail-safe design prevents accidents in case of an unexpected shut-down. ​Technology development was completed in April but researchers had to set up their own production company because there were no local companies with enough skills and equipment to craft the high-tech robot leg powered by a battery. It is capable of walking for a maximum of four hours from full to zero. The first commercial product was presented to Army sergeant first class Kim Jung-won who lost his right foot, ankle and the lower part of his calf in the 2015 explosion of a North Korean mine in the demilitarized zone (DMZ), a four-kilometer-wide strip of land that has divided the Korean peninsula since an armistice accord ended the three-year conflict in 1953. Helped by a military hospital, Kim participated in the project from its development phase. Researchers have studied his walking pattern for two months to create a customized final product. "Unlike other prosthetic legs, this smart robot leg is very soft and makes me feel like a real leg," Kim was quoted as saying. 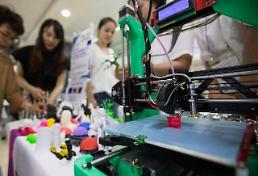 According to Grand View Research, a San Francisco-based market research company, the global market for robot prosthetics will reach $1.7 billion by 2025.